One of the negatives with respect to digital art is that the concept of an original does not apply as it does with traditional art. With traditional art the original is the physical media to which physical paint has been applied and there will be only one. With digital art the concept of a physical original does not apply because of the nature of digital files, which are basically infinitely reproducible. What has long been viewed as a shortcoming does offer digital artists at least one unique capability. 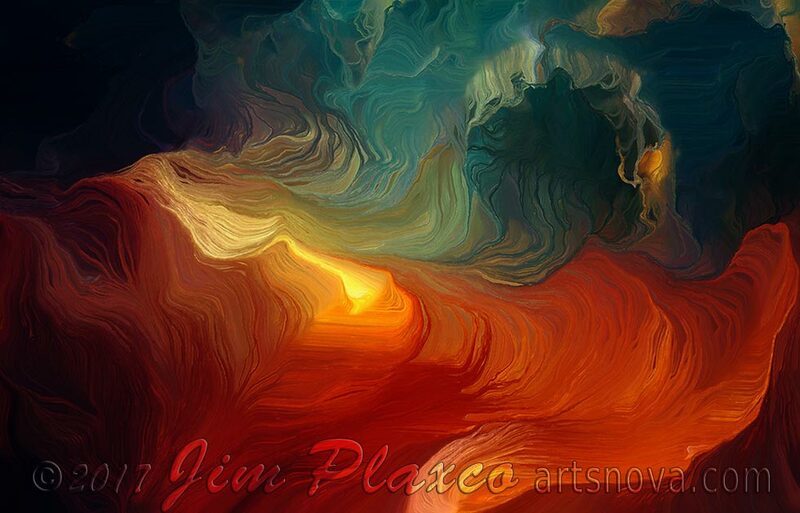 Because the original artwork is a digital file that can be duplicated, it is possible to use that digital canvas as the foundation for the creation of other derivative artworks. One piece I recently completed is A Cool Day in Hell which had as its original working title Dante’s Inferno. In creating this artwork, I used one of the generative painting programs I’d designed. The program could be characterized as the Adobe Photoshop Paintbrush Engine on steroids. With one set of parameters, I can entrust the program to do the entire painting by itself. This would be similar to the filter features of Adobe Photoshop or the auto-paint feature of Corel Painter. With another set of parameters, the program functions very much like the paintbrushes in Photoshop and Painter when placed under the artist’s control. The most interesting set of parameters are those that blend program autonomy with some degree of artist interaction. It was this third option that I used to create this particular artwork. It was only after adding this art to my portfolio on Redbubble that I decided to take that artwork and use it as the starting point for another artwork. I decided to use the same generative painting program that I had used for the original piece. 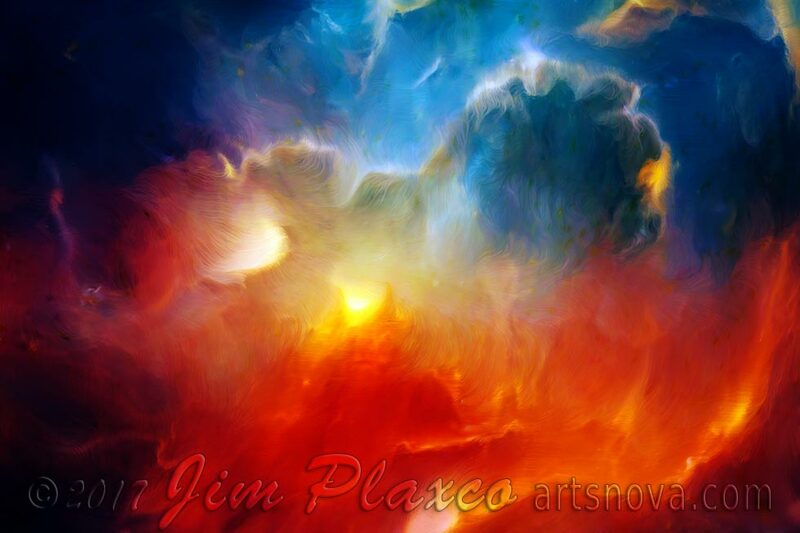 This derivative artwork, titled Passage to Oblivion, does bear a resemblance to the original on which it is based. While similar, the two have different color temperatures, textural feel, tone and contrast. Compositionally, the large, open, somewhat mountainous subterranean landscape of A Cool Day in Hell is transformed into a claustrophobic feeling of being inside an eerie underground cave. To see either of these two artworks on Redbubble, simply click the appropriate image above and the Redbubble page will open in a new tab on your browser. 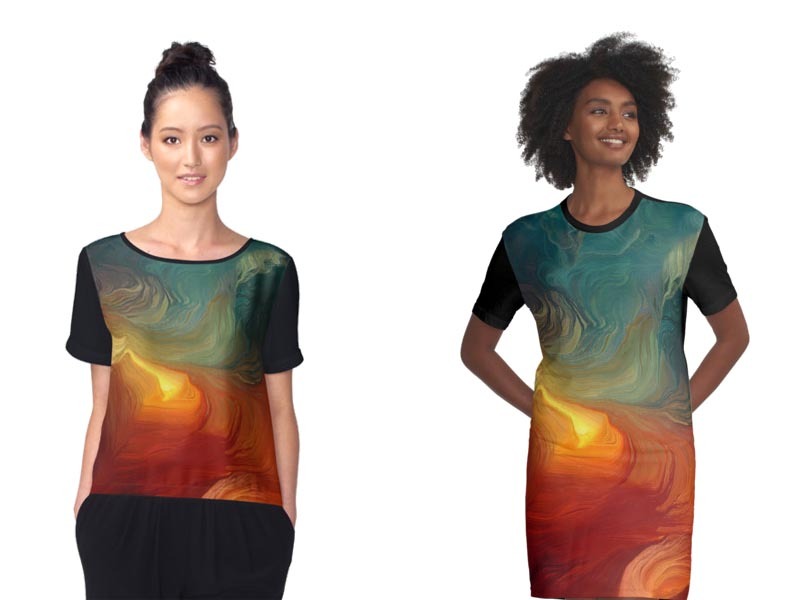 It’s particularly interesting to see how these two artworks look when applied to apparel. This entry was posted on Friday, March 24th, 2017 at 1:44 pm	and is filed under Artworks, Digital Art, Generative Art, New Media Art, Product Art. You can follow any responses to this entry through the RSS 2.0 feed. Both comments and pings are currently closed.